Anymore, pinball is an archaic amusement found in the corners of old arcades and bars, but in the mid twentieth century it was the center of a moral panic. Cities across the country banned pinball for its associations with gambling. Most notably, New York’s mayor Fiorello La Guardia had machines rounded up and smashed, often in highly visible public settings. The game’s association with gambling wasn’t baseless, though. 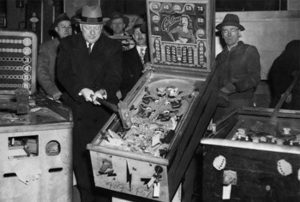 After prohibition, coin machines did become a notable stream of income for organized crime, and some pinball tables did indeed disperse cash or prizes. It wasn’t until 1976 that the New York ban was lifted, and that pinball became a commonplace and acceptable amusement. I’ve previously written about pinball and organized crime in Oregon for the Portland Mercury. Check out that feature here.